One of the unique staples of Slovak and Czech kitchens is not a dish, but a side. There are several dishes that are traditionally served not with the standard helping of rice or potatoes, but with a dumpling. Now, this isn’t your typical dumpling. It isn’t a round ball filled with some meats or vegetables. Instead, it is the size of a large loaf of bread. It is sliced, just like a bread would be, and maybe 4 or 5 slices will be served with your meal. This dumpling is called parená knedľa (steamed dumpling). Sometimes it’s also referred to as the kysnutá knedľa (leavened dumpling). It is commonly served with saucy dishes – such as various goulashes or stuffed peppers. It is a great combination! You cut the dumpling into small, bite-size pieces and use them to soak up the juice. In this recipe, I show you how to prepare the dumpling. It’s not very difficult, but there are few tricky steps along the way. Just make sure to follow the steps and you will be fine. Take little bit of milk (mlieko), and heat it up in the microwave for about 10 seconds so it’s lukewarm. Add one teaspoon of sugar (cukor) and a packet of yeast (droždie). Whisk well to aerate the concoction and let sit for about 10 minutes. The yeast will rise. 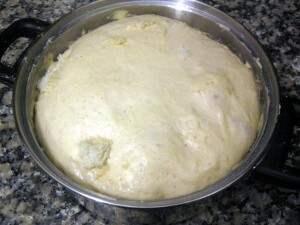 In a pot, combine about 500g of flour (múka), one egg (vajce), few dashes of salt (soľ), the yeast mixture and about 0.2L of room temperature milk. You don’t want the milk to be too cold, otherwise the yeast may stop working. Stir everything together, and knead for about 10 minutes. You want the dough to be smooth, and non-sticky. You should be able to remove the wooden spoon without the dough sticking to it. Simply add more flour if you need to make it less sticky. 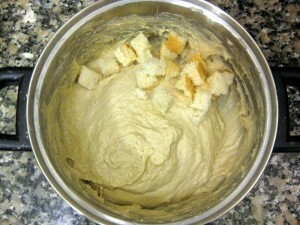 Next take a slice of stale, few days-old white bread (biely chlieb), and cut it into small cubes. Gently mix it in. From my own observation, adding bread is much more common in the Czech republic. Dumplings in Slovakia are often made without it. Feel free to skip this step. Cover the pot with some cloth and let sit for about 2 hours. Or, if your pot is on the smaller side (like mine was), until the dough starts getting dangerously close to the top, which took only about an hour. Dust a wooden board with flour and form the dough into two loafs. The dumplings will approximately double in size when you cook them. Keep this in mind, if you don’t have a very large pot. 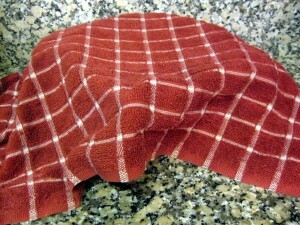 Cover by a cloth, and let sit for another 20 minutes. Bring salted water to boil in a large pot. Make sure you have a lid for this pot. Being single, my kitchen contains just two pots. The big one is not really big at all, so I had to cook the dumplings one at a time. Luckily Slovak cooking requires very little kitchen equipment! Hopefully your pot is bigger so you can cook both dumplings at once. Anyway, once the water is boiling, carefully place the dumpling in the pot. It should float. If it doesn’t, take a ladle and scoop to the top. Cover immediately. Reduce the heat so the pot doesn’t boil over, but make sure the water stays boiling. You want the steam – the dumpling actually cooks from the hot steam. So for this reason, make sure not to open the lid until done. This is very important! Otherwise, the dumpling won’t come out puffy. Cook for 18 minutes. Use a ladle, or two coffee plates to remove the dumpling. Poke the dumpling in couple places with a fork to let the steam out. Then, take a sewing thread (or a dental floss), and use it to slice the dumpling. Supposedly there are dedicated dumpling slicers, but this is so much easier! And there you have it. For a delicious meal to go with a knedla, try the Segedin goulash. So what if you want to make the knedľa right, and completely steam it? The method I outlined above works great, but the bottom of the dumpling will get little soggy (although it will dry in the fridge). To keep this from happening, steam the entire dumpling. The traditional way of doing this is by pouring water into a large pot, covering the top with a clean cloth, and securing the cloth by tying a string around the circumference of the pot. Bring the water to boil. 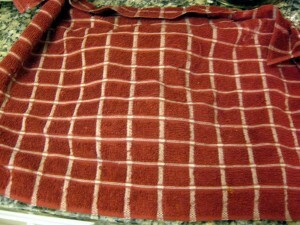 Then place the dumpling on this cloth and cover by another, equally large pot (or a tall lid if you happen to have one). Make sure there is enough water in the pot for the 20 minute steam bath. This process is identical to how my grandma steamed sweet dumplings (buchty na pare). That’s all great, but what if you don’t happen to have two large pots, a clean cloth, or a string? Or in other words, what if you want to use some modern advances in cooking technology? Well, you already have all you need if you happen to have one of the combo steam pots shown below. I found this blue one in the kitchen of the house where I am currently staying, and it made making knedľa so much easier! The only small issue that popped up was that this pot was fairly small in diameter, resulting in the dumpling expanding mostly sideways. The final dumpling was no longer than a small ear of corn. This type of a double-steam pot makes making these dumplings so much easier! 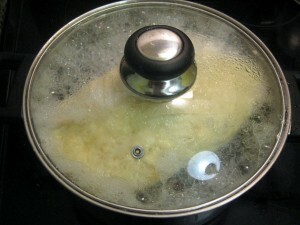 Add enough water to the pot, bring to boil, place dumpling in the basket, cover the lid and steam for about 20 minutes. Now, let’s talk about re-heating a steamed dumpling. How do you properly reheat a knedľa? The dumplings tend to get dry in the fridge (keep them tightly wrapped in paper or shrink wrap), so before placing them in a microwave, lightly sprinkle water over them. The resulting steam will soften the dumplings. Reheat for about 20 seconds. Enjoy with Hungarian goulash or any other stew. 123 comments - What do you think? Do you have a variation on the recipe (I heard some people put beer among other things in the dough)? I would love to hear it! Please leave a comment and share. Tak teda ta knedla si Ti vydarila! I can’t wait to try this! I had this dumpling served with a dinner that included red cabbage and pork on a recent visit to see family in Slovakia. It was wonderful!! Thank you for translating these recipies!! Yeah, that dish is great. It’s called vepřo-knedlo-zelo (pork, dumpling, cabbage), and it’s what I consider the national dish of the Czech republic. Let me know how they turn out. Yesterday I had this crazy idea to see what would happen if I soaked the dumplings in egg, and made French toast out of them. Surprisingly they tasted really good! that’s actually quite common in Slovakia 🙂 it’s what we used to do with leftover knedla and ate it for dinner. I loved it! This is typical let´s go use leftovers slovak dish, you can dip slices or you can cut them in cubes, this one is more for children, i used to eat that as a child, also you can do that with bread typical Bundash Kenyir from Kosice and about the dumplings: the usual is not to put them in the water but put them aout from water in devices such as metallic plates designed for this use ( in norway they use for boiling vegetables) or typical homemade device: you atach with the cord or gum a piece of very thin close to the top of the pot and on this close you place the dumplings and then you cover them with other pot. Easy home made steaming pot ;-D. Dumplings are more fluffy and so wet. I lived on that as a kid. Dumpling ‘n eggs. Mom would dice up the dumpling thou. I am making Chicken Paprikash today, with anoth4er type dumpling..Halusky…one of my families favorites.. I love paprikash with halusky! If you would like, you can take photos and post your recipe. Otherwise, I’ll have to make this dish in a near future. Thanks for reminding me. hi. please post recepie for buchty and byrndza halusky and zemiaky placky. i got one packet of zemiaky placky but it is written in slovak. can you send in the recepie. I just posted the buchty recipe. And here is the link the recipe for bryndzové halušky. They didn’t turn out looking as nice as what you may have seen in a restaurant, I think because I didn’t have the right kind of a strainer. Thanks for the suggestion for zemiakové placky (haruľa). I’ll make these soon. It’s a great snack. Hi Rama, I just posted the recipe for potato pancakes. Yes! I think I finally found the right recipe. We had a restaurant ran by a hungarian cook that made raised dumplings that look like these. I remember them being rye bread with caraway seeds in it. They were made in a loaf then sliced after they were cooked. He always was giving me plates of them because “I was to skinny” sliced with pork gravy on top!!! Does this ring a bell with anyone else? There are only cubes of DRY white bread, never rye bread w/caraway. Can you make steamed dumplings ahead of time and then when ready to serve rehet and slice them??? How would you reheat them? You can, but they are good for only a day, two max. They get hard after that. I usually heat them up in the microwave by wrapping them in a wet paper towel. Lubos, knedla will keep for much longer then 2 days. I even freeze it and use when I need it and have no time to make fresh. Do not use microwave to reheat. Use the steam, exactly as you did the first time. It takes about 2 minutes to warm them up, if frozen a little longer. i bet you nobody would know that they are reheated. Thanks Lubos. I love knedla & I will try to make it tomorrow. I work with many Slovaks here in Cookstown in Northern Ireland…. I have been to Slovakia twice now and I have aquired an appetite for the food. Cheers. Knedliky is a Czech (and German) side dish, not Slovakian at all. Slovaks stolen the knedliky from the Czech cuisine. Few years ago we could eat only halusky (or rice or potatoes) in Slovakian restaurants, knedliky was considered as a Czech food. In Slovak villages among the Slovak peasants the knedliky is a totally unknown food today. Hi Anton. What’s the source for your info? I admit I do not know much about the history of knedle, but I am pretty sure they have been eaten in Slovakia for at least the last 50 years. For instance, this recipe comes from a Slovak cookbook published in the 1950s. Many recipes in that book also call for the dish to be served with knedla. Knedle are very commonly prepared by the villagers. Both of my grandmas prepare them on a regular basis. I grew up in New Your eating this dish. It was called by two names in our home–knedl’a in Slovak, Knodel in German. Sometimes we made it with the dried bread cubes, sometimes without. We made another kind of dumpling that was mostly made from dried bread, combined with egg, milk and onion, formed into a loaf and steamed. I will be cooking this weekend! Wow, you must be kidding me. Anton , how old are you, I just wonder. Did you ever live in Slovak Republic? My Slovak grandmother taught my mom how to make knedla and she taught me. My grandmother was from a village outside Bratislava and would be 121 and brought her recipes from “the old country.” There is incredible mixing of recipes and food choices shared among people whose country borders have long been fluid. Interestingly, my husband, whose family (both sides) has been in the US from before the American Revolution and he thinks of my Slovak dishes as American food, because he’s been eating it since we met 47 years ago. I found this out when I started planning a “dining down the Danube” menu for our fine dining club dinner, he said “how is this different from what we eat all the time?” Incidentslly, the menu is simple: goulash (Hungary), knedla (Slovakia), braised red cabbage (Germany), Sachertorte (Austria), and, as a bonus if I can stretch the dough properly, my grandmother’s apple strudel (Slovak, not Austrian), accompanied by German beer and wine for dinner and coffee for dessert (as done in the coffee shop my husband and I visited in Vienna). I come from Austria, but my grandfather was born is a rusyn village in eastern Slovakia. My grandfather’s family didn’t prepare knedliky, but halusky was an everyday staple with bryndza or sauerkraut. I think your grandmothers come from the Czech borderlands. What was the dish that eaten with knedliky (as a granish) at your grandmother”s housholds? In Austria knedliky is commonly called “Böhmische Knödel”, which means Bohemian (=Czech) dumplings. In Austria and in some parts of Germany raised (yeasted) dumplings are also cooked, but they are cooked in small balls (not in a whole bread-like loaf)and Germans and Austrians eat this Knödeln with Sauerbraten (similar to Czech svickova). Have you got a recipe for Svickova? It is a very good Czech dish (You can find in almost all restaurants in Prague), but probably eaten in some parts of Slovakia too. Unfortunately my rusyn-slovakian grandfather never heard about it. Hi Anton, I come from Banská Bystrica, smack in the middle of Slovakia. I am finding out, thorough the comments left on this website and the additional reading they lead me to do, that the cuisine of eastern Slovakia is very much different from the rest of the country. A while ago somebody asked me if I heard of a “yucha” soup, which was prepared on Christmas by his grandma. I eventually track this down, and found an article about Christmas dishes in Eastern Slovakia. One of them was this mysterious soup. Also, my family never prepared pierogis (pirohy). I always thought of them as a Polish or a Russian dish. But in America, I met quite a few Slovak-Americans who consider pierogis staple of Slovak cuisine. Coincidentally, majority of them comes (originally) from the east. Just out of curiousity, did your grandma make them? It’s been a while since I’ve been to Austria, but I’ve had some Knödel in in Munich. They were delicious and definitely different from the Slovak ones! Even the Czech dumplings are different. Czechs make two kinds, these plain flour ones, and a darker kind. And I love “sviečková na smotane”. I actually just had it yesterday, but I didn’t get a chance to take photos. But I’ll add the recipe before I head back to the States. I think the soup you mentioned is a sauerkraut soup similar your kapustnica soup. My grandfather’s wife (my grandmother died in the 1960s)often cooks this (especially for Christmas eve)with smoked pork and frankfurters. I’m not familiar with the Slovakian name, because I don’t speak this language. She cooked few years ago a very interesting Christmas dessert. This was a puding like dessert and contained cooked wheat (or maybe barley or some other cereal)and poppy seed and was very sweet. Are you familiar with it? Unfortunately I can’t ask my grandfather’s wife, because she is very old and ill. I have never tasted pirogi, but I have heard about it as an Russian or Polish food. Hello! I’m so glad I found this recipe. I just recently had my first Knedľa. They were store bought, but were good none the less. My boyfriend’s mother is Slovak and did not have her mother’s recipe to make them. I am excited to try to make them for my boyfriend and myself. She had made them with beef tongue and a dill gravy. Would you happen to know of any recipes for this? Edee, Let me see what I can do. You already know how to make knedlu. Boil the tongue in salt water, add some black pepper, caraway seeds, boil until soft. slice the tongue into thin slices and serve with knedlou and dill sauce. Do knedle sa nedava ziaden chleba. A hlavne, ked sa to vola Parena knedla, tak sa to ma PARIT a nie varit vo vode. But you are right, adding bread is not required (I think I even mentioned this in the recipe). My grandma also only steams her knedle, the way you suggested. She does this by placing a cloth over the pot of boiling water and fastening it either with a very large rubber band or with a string. She then places knedle on top of this cloth. I wanted to try this other method (also from “Recepty Starej Mamy”) because it seemed like less work – and less cleanup. In the end, I think the two methods are more-or-less identical. The dumpling floats in water, so only a small bottom section gets actually cooked. The rest gets steamed. That’s why it’s so important to keep the lid on the pot while cooking. Anyway, if you like, you can send me step-by-step photos of you preparing various Slovak food. I’ll be more than glad to post them to the website. Austrian and German dumplings are different. They are made from potatoes, and are cooked in boiling water. They usually make small balls or ovals. To prepare it you have to boil potatoes then you have to press them to make a mash. Add salt, egg and big grain flour (hruba muka – admin correct me if I am not correct). Than you make a balls or any other shape and boil them in salty water until they are tough ( roughly 12 min) leave them to chill. majka, not really, halusky are made a different way, you don’t boil a potato, you shred it raw and then mix the raw shredded potato with flour and then keep doing stuff like cutting a small cuts of mixture into boiling water. that’s halusky in original recipe and the way it was done for centuries. how do I know? Heck, I am 70 years old (close to be centenarian) born in Slovakia and we always did it that way. raw potato, no eggs. Halusky rule!! The dough didn’t rise a lot after the 2 hours and I ended up with 2 tiny loaves. Boiled them for 18 mins but they were raw…right size though. You wrote that I was supposed to knead the dough for 10 mins. I did it with my hands but I remember my ex mother in law doing it with a wooden spoon. Do you think that might have been the reason? And with concern to the 18 mins. Can they stay longer? sorry to bother you. I know knedla is not easy. I made gulash though and it was perfect. thanks. Barbara, what kind of yeast did you use? And when you “primed it” (not sure what the right technical word is) did it get bubbly like in the picture? Perhaps the yeast you used was old or somehow defective. The reason for kneading is to give the yeast air. Yeast requires two ingredients to operate: sugar and air. These are then converted into carbon dioxide (bubbles) and alcohol (less important here, but more so in brewing beer, for instance). Hi there, thanks for answering my questions! In the end it worked but I steamed the knedla..didn’t boil them and it worked perfectly. Maybe it also depends on water composition. It might sound strange but water in Rome contains a lot of scale. But in the end I made it and it was vyborne! thanks a lot, you ‘doing a great job with this website..
lubos…. if i ever open a restaurant i will totally have it on my menu! Last week I made the bread dumplings along with the saurkraut and pork goulash……….though they spread out a tad more then up, the taste was great and something I rarely say but i’ll definately make it over and over again (My husband has gotten to the point of saying Don’t ask me if you can make a recipe again cuz you NEVER make the same thing twice) So the fact that I want to make it over and over is definately a compliment……..and I want to say Taksa mychet for taking the time to put the recipe up………..
Som straaasne nadsena z tejto stranky a velmi vdacna tvorcovi za jej existovanie! Hned je to poznat ked niekto nieco robi s radostou a potesenim. Dobra praca! I made my first knedla today (according ur recipe) and everything went great! And I made svieckova na smotane for the first time and it was delicious. Thanx for posting the recipe and for nice web site! Great job! Hi – I really like your website very much and the recepise sound great. My only problem is I am having a hard time trying to transform the metric system (of grams, kilo, deka) etc. into pounds and oz., . The parene buchty sounds so great but 500 grams of flour how do I figure out what it is in pounds. Thanks for your help. Thank you Dagmar! I try to convert the weights where possible – but on some recipes I did get lazy. When it comes to converting between kilograms and pounds, the process is easy. Just multiply the kilograms by 2.2 to get the weight in pounds (or by 2 for a quick estimate). Or for an even quicker estimate, it’s approximately half of the smallest package of “Gold Medal” all-purpose flour. That is what I used in making of this recipe. I did not actually weigh the flour. Now, when it comes to making dough, don’t believe any numbers listed here, or in any recipe. Making dough is really an art. The flower amounts are estimates at best. The best way is to start with a bowl of flour into which you add little bit of water. Work the water in with your hands (this is how my grandma does it). 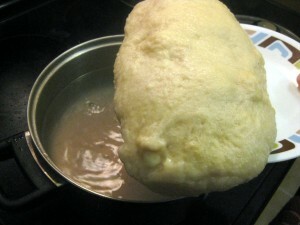 Most likely you will not have enough – and in your bowl you will have dry flour with small dough balls. Add more water until you get smooth mixture that resembles the photos. And similarly, if the dough gets to watery, just add more flour. 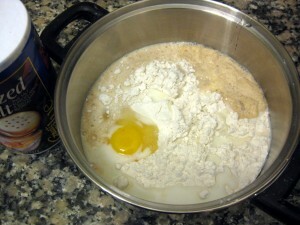 NOTE: if you dont’ have a measuring cup, you can use any other coffee mug for flour and then for milk/water. It will turn out just fine. It will be a proper balance of ingredients. It is not very practical to list “1 pkg of yeast”, because recipes on Internet are used all over the World. Can you please indicate how many grams is on YOUR package of yeast? My husband from Czech. You can make dumplings in advance then slice them.And put them in a zip lock bag and freeze up to month. When you need them just defrost in a room temperature and Steam a few minutes in a steamer, they taste the same as fresh made. Hi – I am half Czech and half Slovak – we cut the dumplings up in little pieces , fry them in a little butter, bacon fat, or even olive oil, scramble some eggs in a cup and pour all over the dumplings for breakfast.Salt and pepper. Thanks for your great website, I been using it a lot. Today I am making my first knedla. The first dough didn’t work out but the second one seems to be rising well. Its so tricky :-). When my brothers and I were little we used to sit under the kitchen table (we thought we were being sneaky and hiding)while bubba and mother were making them. We would reach up and snag a couple when they turned their backs and just stuff them down while warm. Hello Lubos, I have a variation on this recipe. Take a look at this video, I followed their instructions and prepared it today, with little modification and it was so good everybody loved it. I used smoked pork ribs, kielbasa, bacon, fresh pork meat, beef stock, sauerkraut, fresh cabbage and bread dough. My mom told me about it and after researched a lot in the net I found this video, it is in Portuguese. Regards. My Bohemian grandmother (i’m third generation US-born; my great-grandfather was a draft-dodger…) made dumplings like this, but my Atlanta-born mother never managed to learn the trick of it (she learnt several others, though…). So happy to see this recipe. I *will* make these soon. I just noticed you on Foodbuzz.com. My Czech mother used to make these dumplings all the time, by hand. In duplicating her recipes over the years,with varying degrees of success, I’ve discovered a secret: use a breadmaker. Use the “dough only” setting and you end up with the loaf exactly the way it should be. I steam mine for 20 minutes after pulling them out of the breadmaker, and the results are excellent. For you purists out there that think using a breadmaker is blasphemous, I can guarantee you that if my Mom were alive today, she’d use one too! Hi John, I am one of those purists. 🙂 I am willing to exchange bit of perfection in the result for the bliss of uncluttering my life from gadgets and other material possessions. But to each his own, I bet a bread maker would work awesome here. Did you Czech mom used to make the potato variety? That one is more common in the Czech Republic if I am not mistaken. She would very occasionally make the potato variety, but my Dad and I loved the steamed dumplings, so that is what she always made. 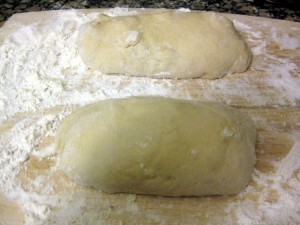 I just remember the hard work involved with kneading the dough. Just out of curiosity, is Roast Duck or Red Cabbage part of Slovak cuisine, or is that primarily a Czech thing? Not sure about the duck, but roasted meat with red cabbage is also very popular in Slovakia, although I think it is more common in the Czech republic. We just don’t call it knedlo vepřo zelo but pečené mäso s kapustou, baked meat with cabbage. I very much like it! It’s actually on my short list, I have a few pound piece of pork roast in the freezer waiting to be put to use. I sort of remember my grandma at one point baking a duck, but she bakes goose much more frequently (but not nearly as often as chicken or pork). My Czech mother in law made a steamed dumpling that sounds much like what you are talking about but she called it shiski. We had it every Sunday until she passed away. She steamed it over boiling water and it was quite yellow. The consistency looked much like that in your photos. We served it with chicken gravy and fried chicken. I enjoyed reading this steamed dumpling recipe, as I had never eaten these until last summer I went to Tabor picnic grounds in Geauga County, Ohio. I thought they ran out of dumplings and gave me bread. My Slovak mom made the other kind of dumplings that you spoon into the water and they are done when they get to the top. My Hungarian friends made wonderful dumplings. I have never liked my own, I call them “sinkers.” I met you in your class at the Pittsburgh Slovak Festival which was a wonderful weekend for me. The Christmas soup you mentioned is a longtime family staple. You’ll need to rehydrate about 1.5 to 2.0 oz. of dried mushrooms in about 4 quarts of water overnight. Strain the liquid a few times through cheesecloth and reserve. Chop the mushrooms as you prefer. Strain about a quart of kapusta and reserve the juice. Depending on how sour you like you soup, squeeze the juice out of the drained cabbage and/or rinse with water. Add back to pot with mushrooms. Add carraway seed to taste. Add reserved sauerkraut juice until the broth tastes right. Options: Add smoked sausage and/or cooked white rice. when you say 500g of flour, how much is that in cups? When you say 1.25L of milk, how much is this in cups? Hi Rosie, 500g of flour is 4 cups, and 1.25L is 5 cups. However, go by the “feel” and “consistency”. 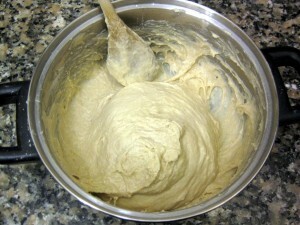 If the dough is too thin, add more flour, and if too thick, add more liquid. 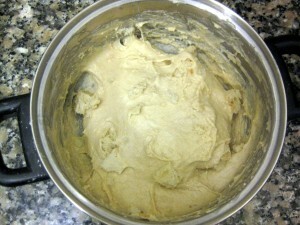 The dough should look like in the photos above. I made this tonight with pork roast and cabbage! Slovak cuisine has been my favorite for years, but I never found this website until today. I can’t wait to use your recipe for Lettuce soup. It’s one of my favorite soups. Also some of the gulas recipes. Nemáš za čo, Betka. I am glad you liked it! we make sweet dumpling style in cout out rounds leavened twice and steam it the traditional way you described using a cloth covered deep pan and lid! !then we serve topped with melted butter and sprinkled with a mixture of cocoa and icing sugar. we call it borchte. though we have made it your style but i think we baked it not steamed it and served with a meat and cabbage dish that has cream in it.i ill try this steaming method next time. Has anyone made a variation of this that is filled with hamburger or other meat? 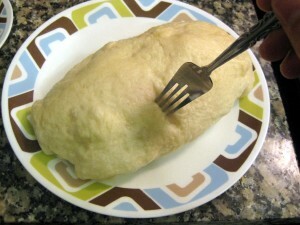 My Mother (German decent) made really large dumpling that she filled with hamburger, wrapped in a torn piece of bed sheet that she tied at the top, and steamed for several hours. Wondering if anyone knows what dumpling recipe would work best for this. Marlene, hľadala som na internete tento druh knedlí. Bohužiaľ. Myslím si však, že toto jedlo sa varí v Rakúsku. Intuícia mi vraví, že knedle plnené mletým masom /ktoré vyzerajú skôr ako gule/ a posypané praženou cibuľou sa podávajú ku kyslej kapuste. Môj bratranec pracuje v Rakúsku ako kuchár, pokúsim sa tento recept zistiť. Steamed dumplings filled with meat are used all over the world, maybe not so much in Slovak cooking but it’s there. It‘s most frequently used in the Far East, China cuisine. But also used in german cuisine, Italian variation is tortellini, in Poland and Russia you have pirogy, etc. here is a good recipe from Chinese cuisine and I think central Europe recipe would be very close to it. Tieto knedle plnené nakrájaným udeným mäsom poznám ako české jedlo, ale varí sa aj na Slovensku. Jedná sa o zemiakové cesto /uvarené zemiaky v šupke ošúpať, rozpučiť alebo postrúhať, posoliť, pridať vajce a hladkú múku-niekto preferuje polohrubú/. /Na Slovensku dostať aj práškové zemiakové cesto/.Vymiesené cesto rozvaľkať, rozkrájať na štvorčeky a plniť plnkou z mäsa, môže byť aj iná údenina. zabaliť a vytvoriť guľky, ktoré sa uvaria vo vriacej osolenej vode. Uvarené sú až vyplávajú na povrch. Podáva sa k tomu zapražená kyslá kapusta. poleje sa to opraženou slaninou, prípadne cibuľkou. Kuchyňa na Záhorí dosť inklinuje k rakúskej kuchyni, ale ja som toto jedlo ešte nejedla. Dali ste mi dobrú nápovedu a teraz som hľadala lepšie a určite som sa trafila. Sú to zemiakové knedle alebo aj zemiakové guľky plnené údeným masom. Našla som tri spôsoby úpravy. Marlene, snáď už je to ono. Prajem dobrú chuť. Určite si zemiakové guľky s údeným masom urobím aj ja. Vyskusala som tvoju knedlu, nemala chybu az na to ze sa mi zdalo trosku privela soli. Parila som ju cez gazu ako to kedysik robievala moja stara mama. 🙂 naozaj sa vydarila. Dakujem za recept!! It is delicious… and, interesting enough, steamed bread is the staple of northern China. But steamed bread–and steamed bread with meat and/or vegetable stuffing–is eaten all over China. Another interesting thing: Family names in China/East Asia are first said, then given names. Wonder if there is a connection? Could it be the Mongol Hordes who conquered China might have brought Chinese traditions when they then conquered Easter Europe… ? Hi Steve, thank you for the insight. That is definitely an interesting and plausible theory. I have never seen dumplings like this, basically steamed bread, anywhere besides Slovakia and the Czech Republic. 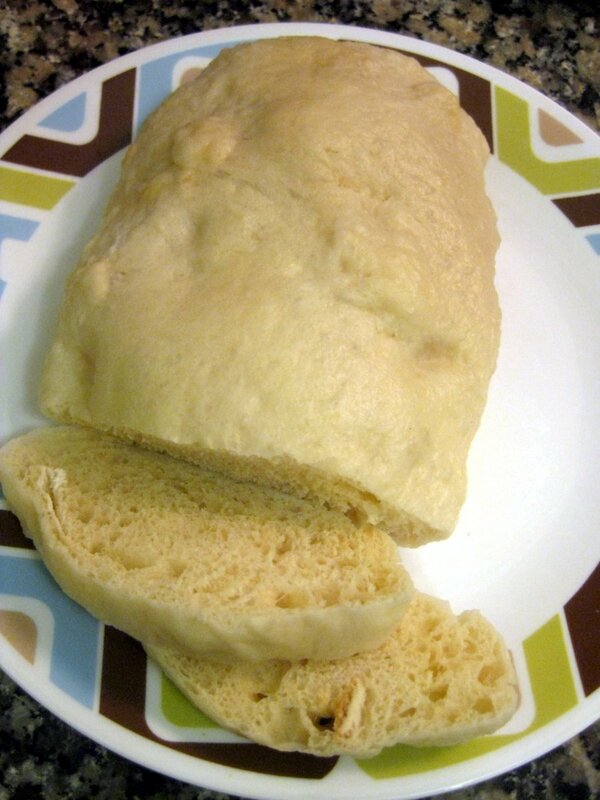 But there is nothing particularly special about them – it is after all just steamed bread dough. I recently visited slovakia at the Tatra mountains where they served a large sweet dumpling which was poured with some sweet sauce and sprinkled with poppy seeds or chocolate powder. Does anyone know where I can get extra information on this particular dish – how to cook it? wHY DO I HAVE PROBLEMS PRINTING YOUR RECIPIES? I have tried with some of the dumplings and finally gave up with fashirky. don’t know, works just fine for me. It must be something with your set up, computer/printer, etc. There is a lot of images and that may cause some problems. I can do a right click on a mouse, select a print or print preview and it comes up just fine. As far as you have a printer able to print text/images you should be fine. Hi there, in your recipe you say add a packet of yeast, unfortunately I don’t have packets only a small jar of dried yeast. How many table spoons do you recon I should use? Please advise. Thank you. The jar of quick rise active yeast (Fleishmans brand) that I have says that 2 and 1/4 teaspoons is equal to one 8g packet. Not sure if it would be the same for you, but hope this helps. As a chemist (retired) I would like to comment on what several others have mentioned in this thread — namely why freezing is preferred over refrigeration when dealing with starch-based items such as bread or dumplings. It has to do with a process called retrogradation, in which gelatinized amylopectin starch molecules are cooled below the gelatinization temperature. In gelatinization, both amylose and amylopectin forms of starch absorb water and lose some of their native crystallinity. In retrogradation, the polymer chains of the starch regain some of this crystallinity and in doing so force absorbed water from the gel in a process called synerisis. To be sure gelatinization of starch is mostly irreversible, so bread once cooked stays cooked. But there is a small amount of retrogradation that can and does occur that results in the process which we call staling. In retrogradation of bread, this results in a noticeable increase in the hardness of the crumb texture. Refrigeration of fresh bread goods does not prevent retrogradation as most people know from experience. But if staling has not gone too far, it is often possible to reheat in the presence of a bit of moisture and restore some of the fresh quality. But with refrigerated bread, even this restoration is fleeting. Here is where a little knowledge of food chemistry, particularly starch chemistry, can come in handy. In the case of steamed dumplings (knedfa), as others have pointed out, this works quite well. 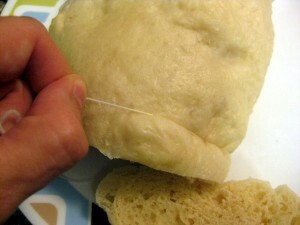 An even better method is to first freeze and then to vacuum seal (using a FoodSaver sealing and baging system) bread or in this case the dumpling. By freezing first, one does not crush the dumpling on vacuum sealing. Slicing the dumpling first would facilitate its later use from the frozen state. To use, either set out as many slices as you will need and cover with a moist towel and let the slices slowly thaw and come to room temperature or resteam them briefly. Or with a small potential loss in quality, one could moisten a paper towel, wrap the frozen slices a few at a time in the moistened towel and microwave briefly, being careful not to over heat. Doing the slices a few at a time avoids overheating in an attempt to heat the still frozen centers while overheating the exterior. **Freezing, while it halts retrogradation, can, if an item is held too long or under the wrong conditions, result in “freezer burn,” or freeze drying loss of moisture by sublimation from ice crystals in the food item to water vapor. This is part of the reason that some rime ices form on the inside of a freezer chamber as some of the moisture comes from the items as well as from repeated opening and closing of the door. To prevent or retard freezer burn, use a vacuum sealed bag method such as the FoodSaver or other such system designed for home use. This will also prevent frozen items from picking up freezer odors and other undesirable organoleptic qualities. Just remember to freeze the bread first, then vacuum bag. Note: freezing first and then bagging works well with other crushable or soft items such as pastries, blueberries, strawberries, etc. Oh my grandmother makes this! Slovak soul food! My son-in-law’s Grandmother used to make bread dumplings for him when he was growing up. So I wanted to try to make bread dumplings for him. I asked him if she cut the dumplings with a string . He said yes. After watching many videos and looking at many recipes I gave it a try. 1st recipe I tried not the type I was looking for. Then I tried this recipe and BINGO JACKPOT !!! He loved them and they were so good I could hardly believe I made them . Thank you for this recipe and the explicit directions. It was known that Billy Mays was taking tramadol and hydrocodone. as it can detect substances in the system over a longer time period. huh? Can you slip in some cooking into our post? this is what my grandmother would make when she made Fassenfeffer(?) rabbit stew. I would not eat the rabbit but I would always eat these. Never could find the right recipe but now I have this is it. She would cut the dumpling with a string. Thanks for the recipe. I’m so glad I came across your site. I’m originally from Bratislava and have been living in USA about 13 years. My mom is a great cook but I didn’t inherited/learned this skill while living in Slovakia. Now with my own family, I’m trying to get back to traditional and soooo tasty meals that I remember from my home table. Knedla was always a little tricky for me to make. Your tips helped alot. I had been to Czechoslovakia in year 1963. I had even seen the dumplings being made several times but was not very confident now. So I had been looking for the recipe since long. I am happy to have found the exact recipe on this site. My mom made the dumpling mix and then pulled individual dumplings off with her hand to add on top of or in the actual goulash. They turned out great and it was part of the goulash itself. Super easy. Knedliky was part of one of my most memorable meals. When I was in college in the early 70s, a married couple, both college professor friends, hosted. He was Czech, she Hungarian. He had just returned from a trip to Russia and proudly produced some Russian vodka and caviar. She made tiny crispy potato pancakes to carry the caviar plus some sour cream and grated onion, which served as an appetizer served with the ice cold vodka. The knedliky was served with some type of goulash. She was quite mysterious about it, but my friend and I later decided it was made from either tongue or kidneys. She sliced the knedliky with floss. Delicious! The accompanying salad looked to be made from dandelion greens and maybe a few other things that gleaned from the lawn. Poverty cuisine has produced some of the world’s great dishes. Knedla na pare, a large, fluffy dumpling steamed on gauze over the boiling water is delicious with roast pork and steamed cabbage, with meat juices poured over the knedla slices. As Robert Dean pointed out you slice the knedla with sewing thread which you slide under the knedla and then you cross two ends to opposite sites all the way down. Hi Lubos. I am making your recipe now and my dough is really dry. In your recipe you say it’s 0.25l milk but in one comment you say 1.25l milk. Which one is it?? DAKUJEM = THANK YOU ! When I come to Australia we do not have fresh yeast or special flour then we use what been available. Today we can purchase continental flour – polohruba muka and these I mix 50/50 with plain flour and do not use bread. Just make plain dumpling that is great. Po Slovensky: Ked som prisla zit do Australie tak v tedy sa nedalo kupit vela a tak sme museli pouzit co bolo. Dnes uz mame aj polohrubu a hrubu muku. Ja pouzivam na tento knedlik pol a pol polohruej a hladkej muky a knedlik je vyborny. Taktiez som to skusila s pivom a je chutny len na moju chut treba pridat viac cukru. Dobru chut ! This looks so tasty! Definitely going to try this one! Thank you for sharing! I’ve always wanted to make my own dumplings. I always consume store-bought ones. I will be trying this one out. Thanks for the recipe!